In our last several blogs, we discussed summer remodeling projects and how the electricians at Front Range Electric can help you make your dreams for your Colorado Springs home a reality. Summer, though for some can be a incredibly busy time of year, can also be one of the best times to start your remodeling projects. To read more about how to begin remodeling and some remodeling projects to begin this summer, read our previous blog posts. This week we are going to talk about something that most of us do not think about at all and most when they think about maintenance, do not consider: Electrical panels. So, what are electrical panels? Electrical panels are those metal boxes that have the breakers, also sometimes called switches; the box that holds the electrical panel is either hung on the wall or, in many cases set into the wall. Some may remember times at home or at a summer camp bathroom when one too many hair dryers are running and suddenly the lights would go out. Possibly your dad or camp counselor would have to “flip” the switch or breaker and suddenly there would be power again: They would go to the break box and electrical panel to flip the appropriate breaker. An electrical panel is the means in which you can turn the power to your house on and off and protects the electrical wiring and electrical system of your home from the damage that can occur from an electrical short or overcurrent. To protect your home, when one of these electrical phenomena occurs the electrical panel may “trip” or shuts off a particular circuit and in some cases shut off the power to your entire home. Electricity enters your home for use through wires and the electrical panel which functions as the gate keeper or protector of your home’s electrical system, your appliances, and other devices that are plugged into your wall sockets. 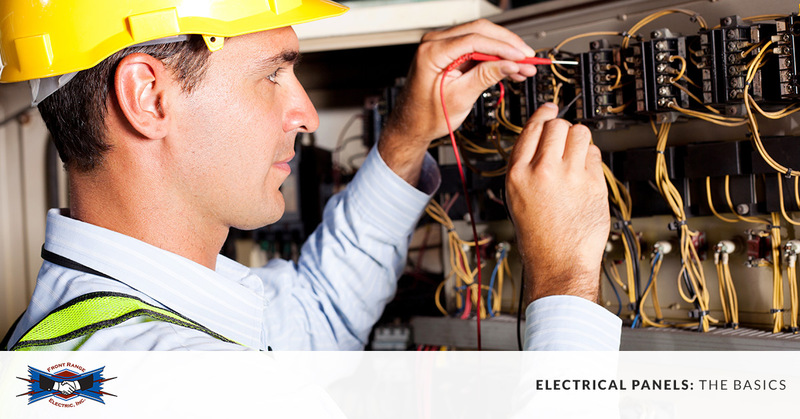 The main breaker’s basic job is to protect the in-home electrical system or circuit that it provides electricity to. This part dictates the amperage of electricity that your panel can handle. Circuit breakers are those that most non-electricians could identify in a breaker box: They are the on-off switches that are used to control the flow of electricity. These are what must be flipped to restore power to particular circuits. The neutral bus bars function as the connection point for a few wires including the circuit’s neutral wire, as well as your home’s main grounding wire, in some cases. The wires that are connected to the neutral bus bar are the white wires that bring the electricity used by appliances and other electrical devices back to the breaker box. These connect the grounding wires to the ground bar and the grounding conductor to complete the system. Our electrical panels are incredibly important to not only protect your home’s electrical system, but also all that depends on electricity to function. To learn more about electrical panels, why your might need maintenance, and more stay tuned for our next blog. Do you have questions about your electrical system, feel that the switches of your breaker box are constantly being flipped, or are you considering a remodel of part or your entire home. The electricians of Front Range Electric are here for the residents of Colorado Springs for these and all your other electrical needs including air conditioning repair and maintenance, ceiling fan installation, hot tube connection and more. Visit our website to learn more about us, view coupons, and schedule a free consultation!